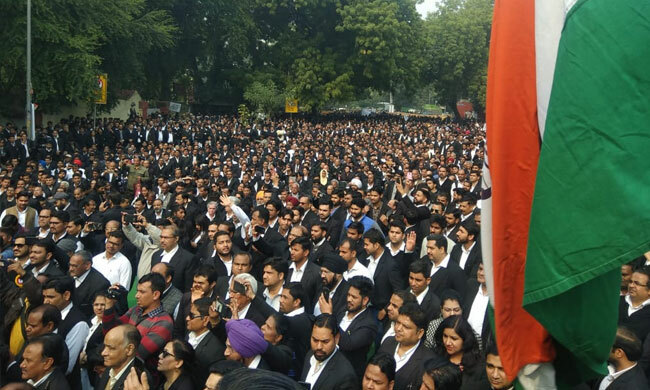 Despite lakhs of lawyers holding protest rallies throughout the country on Tuesday pressing for various welfare measures for advocates, the Union government's attitude and "hollow assurance" left the lawyers dissatisfied and annoyed after which the Bar Council of India resolved of "strong decision" if the demands are not met prior to issuance of notification for the General Elections. The Bar Council of India, however, expressed its "dissatisfaction and dismay" at the hollow assurances given by the Centre following a meeting of 21-member lawyers' delegation with Union Law Minister Ravi Shankar Prasad. Amidst the meeting of protesting lawyers at the Jantar Mantar, Prasad had invited and met a 21-member delegation of Bar led by Bar Council of India chairman Manan Kumar Mishra and assured that he would form a committee of lawyers and some officials to look into the demands so raised but made no concrete promise. The protest rallies were organised to press for demands raised in the joint meeting of Bar Council of India and the state bar council on February 2 which are – All Bar Associations of the country should have chambers, adequate buildings/ accommodation/ sitting facilities, well equipped libraries, canteen on subsidized rates etc, medical facility; insurance; housing schemes; financial assistance to young lawyers; pension schemes; Advocate Protection Act; to amend all the Acts for appointment of retired judges/ judicial officers as presiding officers in various tribunals and commissions etc. In Delhi, 35,000 lawyers participated in the rally from Patiala House courts to Jantar Mantar and the BCI termed it "historic". During the midst of the meeting at Jantar Mantra, Prasad invited Delegation of the Bar over a meetings and held a detailed discussion with the 21-member delegation led by Mishra. BJP General Secretary and Rajya Sabha MP Bhupinder Yadav was also present during this meeting. While Prasad said he will constitute a committee of lawyers and officials to find out ways to take welfare measures for advocates but expressed his inability to grant any corpus fund from the Union Government for the same. Post the meeting with the minister, BCI and the coordination committee and several other Bar Associations expressed their dissatisfaction and dismay on the hollow assurances given by the Union government. Later this evening, BCI decided to convene a meeting of representatives of all State Bar Councils, coordination committee of Bar Associations of Delhi & NCR and the other Bar Associations of the country on March 2. It further resolved that if before the issuance of notification of Parliamentary elections, the government does not accept the demands of the advocates, some strong decision would be taken.